Home Internet Why Google says Your page is not mobile friendly ?? How to find a mobile friendly theme for Blogger.? Friends, for this you have to write in Google Free Template for Blogger,And you will find results of many websites. Friends, you can easily download mobile friendly templates on these websites and also set them on your blog.First of all, we have to know that what is a mobile friendly template?So let's know. What is mobile friendly templates? Friends, when we write a post for our blog, our post looks well on computers and laptops ,But our same post does not show up well in mobile,To see it, we have to adjust the mobile screen several times,But if the theme of our website is mobile friendly then we will not have any problem reading that post and we will not have to adjust the screen of our mobile again and again. How to know the theme of our website is mobile friendly or not.? 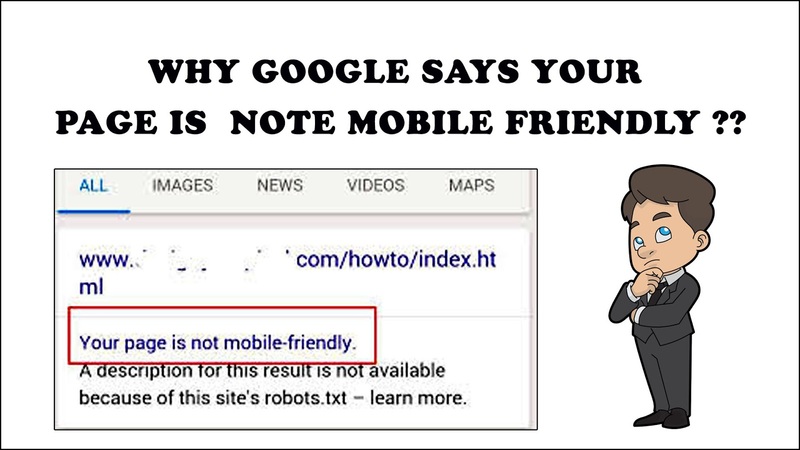 How to check your website mobile friendly or not ? First method is manual :- Guys, in a manual way, we will see our website on the computer screen first and then on the mobile screen,If we do not have to face any trouble viewing our written posts in mobile and our posts are adjusting according to the mobile screen, So the theme of our website is Mobile Friendly Theme. Second method is Webmaster Tools :-How to check mobile friendly website , Mobile Friendly Test For that we have to write in Google Mobile Friendly Test and Google's own Webmaster Tools that will help you find out.